Display a simple widget to show the number of campaigns, amount donated and number of donors. To manage your widgets, log into your WordPress Dashboard and go to Appearance > Customize. 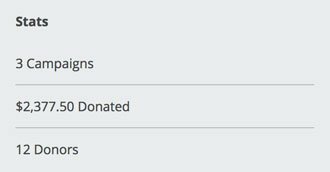 Open up the Widgets panel (in certain themes, this panel may be named something else) and add the Donation Stats widget. Title: The widget title to be displayed at the top of the widget.